Mozzarella cheese is traditionally made from buffalo milk (Mozzarella di Bufala) and it’s one of the many delights Italy is famous for. More widely available today is mozzarella made from cow’s milk – called mozzarella fior di latte or bocconcini. 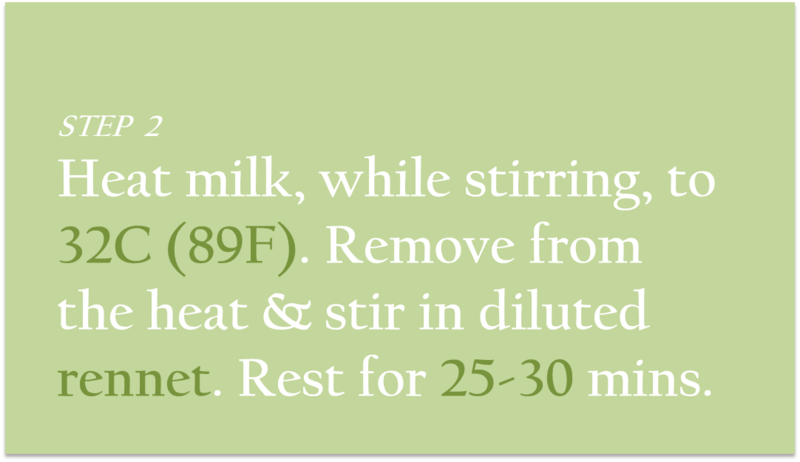 I’ve assumed the chance of you having buffalo milk to hand is slim and so here I’m sharing a recipe for the cow’s milk variety. First the good news – making mozzarella is easy. And once you’ve made your own you’ll probably never buy it again. The bad news – you do need basic cheese making ingredients that aren’t pantry staples. But armed with these and the simple steps below you’ll be adding “cheese maker” to your list of culinary skills within no time. I was lucky enough to attend a mozzarella making class at Salt Meats Cheese in Sydney. The class was hosted by a professional cheese maker and I walked away with a Mad Millie Italian cheese making kit. This recipe is based on my experience at the class and the instructions in my Mad Millie kit. I’ve included more information on Mad Millie at the end of this recipe. Note: I’d recommend that you sterilise all equipment before use. Note: The ingredients above make around 300g (650lb) of mozzarella. If doubling this recipe use the same amount of rennet for 4 litres of milk as you would for 2 litres. STEP 1: Use unhomogenised full cream milk (don’t substitute for low fat or homogenised milk). You can start with chilled milk (there’s no need to bring it to room temperature). 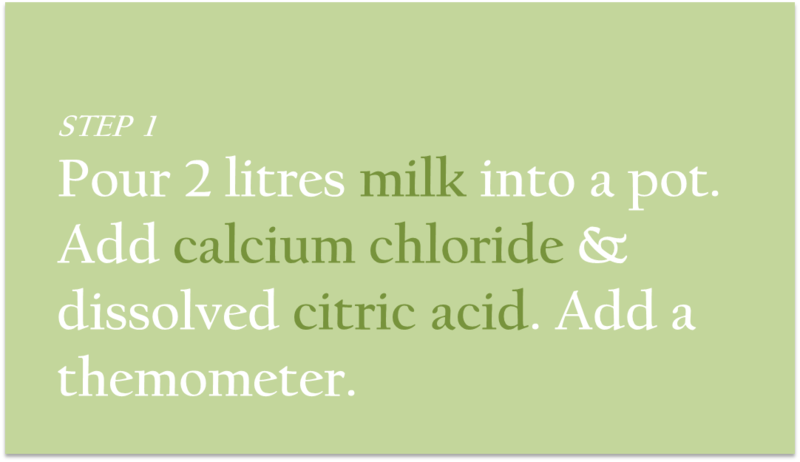 Pour the milk into the pot then add the calcium chloride and stir in the diluted citric acid. The citric acid must be diluted in bottled or boiled water (can’t use tap water as chlorine destroys the active ingredient. Add a thermometer. STEP 2: As you heat the milk constantly stir it and keep close eye on the thermometer – you can use a low or high heat so long you turn off the heat when the temperature reaches 32C (89F). When the heat has been removed add the tablet of diluted rennet and stir constantly to disperse. Rest the pot for 25-30 minutes with the lid on. Don’t stir or move the pot during this time. STEP 3: After 25-30 minutes the milk should’ve set into a gel like consistency. 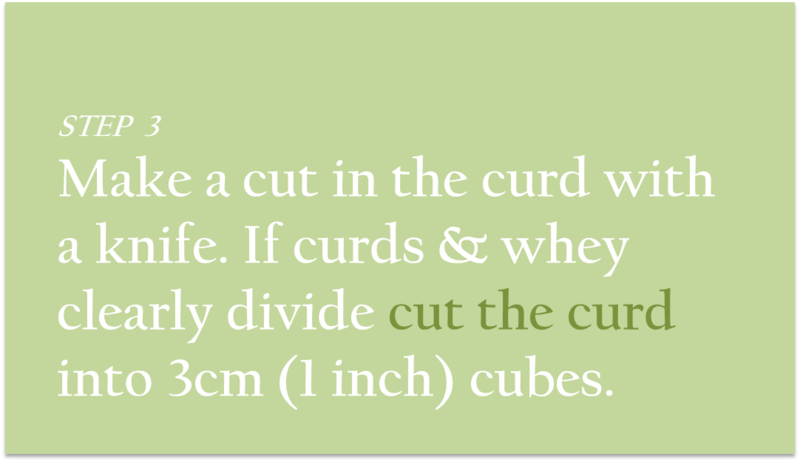 Check the curd by making a small incision with a long knife. If there’s a clear break between the curds and whey then it’s ready. 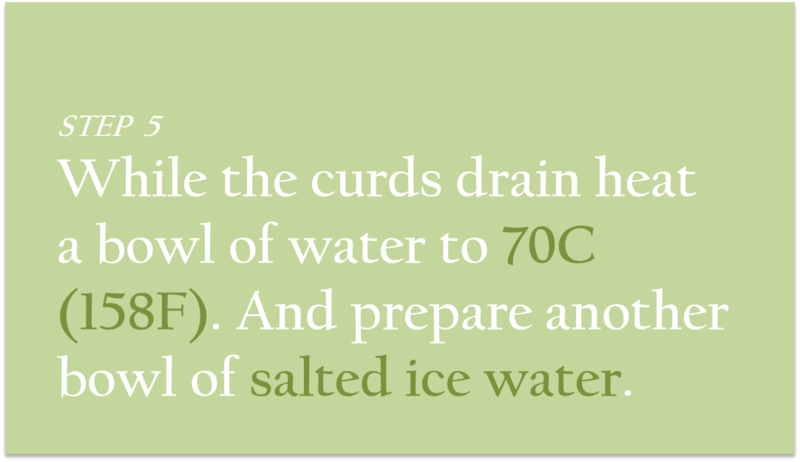 You can then cut the curd into 3cm (1 inch) cubes. STEP 4: Place the pot back on the heat and bring the curds back up to 42C (108F) while stirring gently. Monitor the heat closely because you don’t want it to exceed 42C (108F). The curds should firm up. Then set up a colander lined with a cheese cloth and add in the curds to drain. One bowl of salted water with ice cubes added – add 200-300g (9oz) of salt for every 2 litres of water. 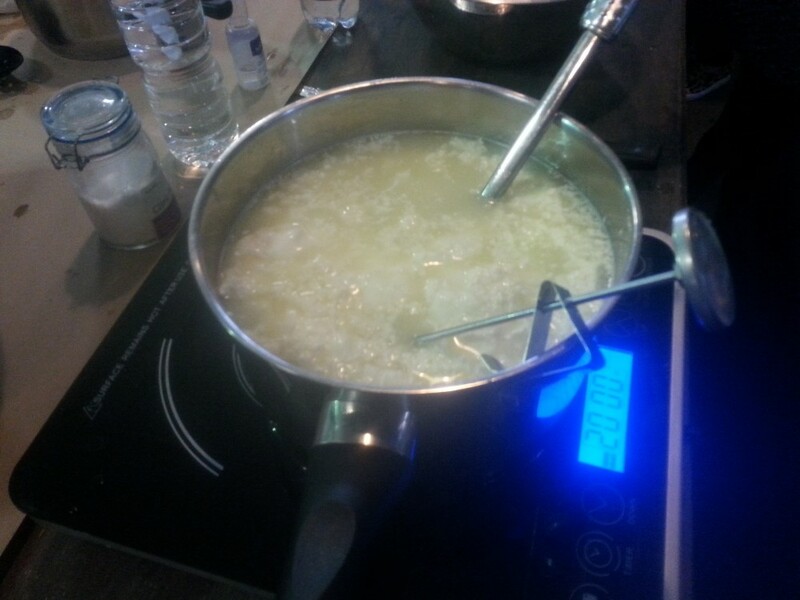 Another bowl of unsalted water heated to 70-80C (158F) – enough to cover the curd that will be added. STEP 6: First place some of the curd onto the draining spoon and lower the spoon into the hot water. 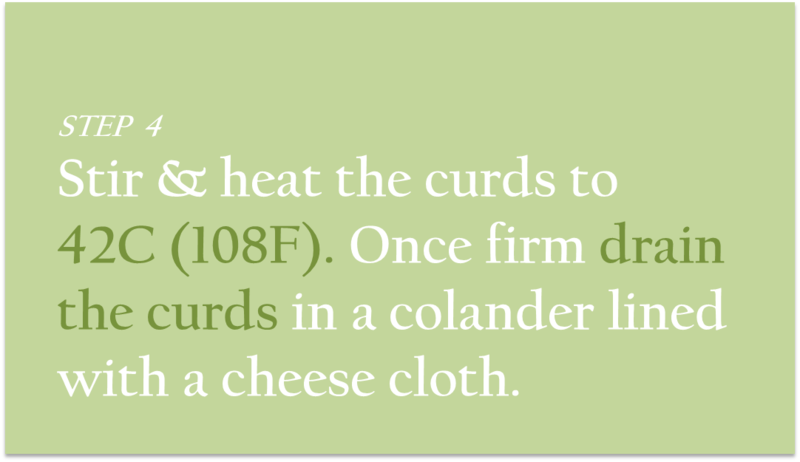 Allow the curds to melt for around 20 seconds while you put on the gloves. 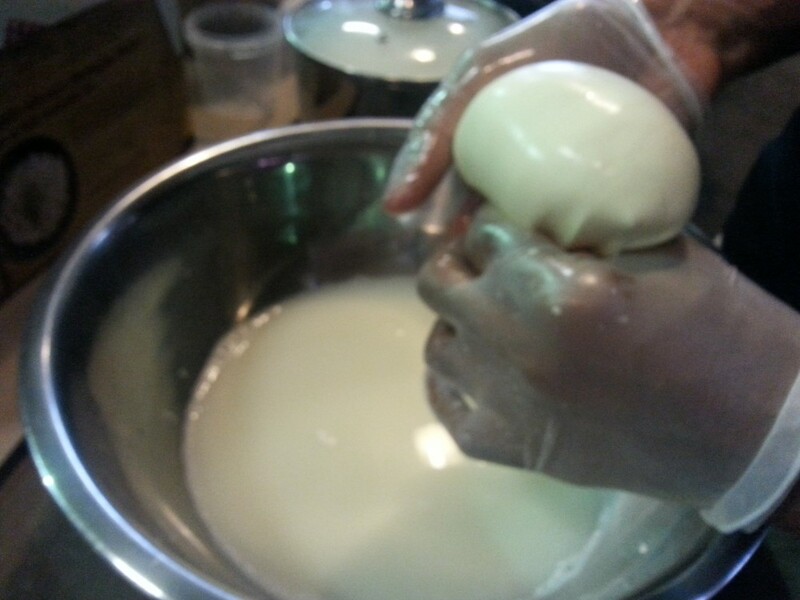 Then bring together the curds in the water with your fingers (the rubber gloves should protect you from the heat). You’re looking to get one big piece that you can stretch a few times out of the water.Now for the fun part –stretch the dough (this lengthens the proteins). 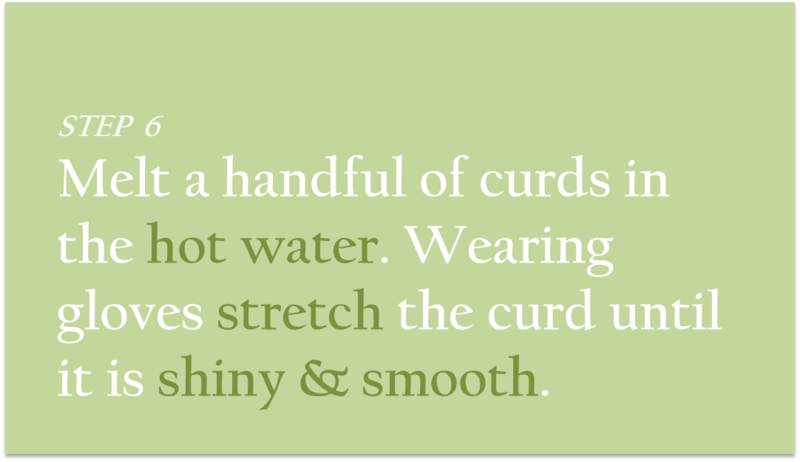 STEP 7: After a few stretches your curd should be glossy and flexible. That’s the sign that it’s ready to shape. 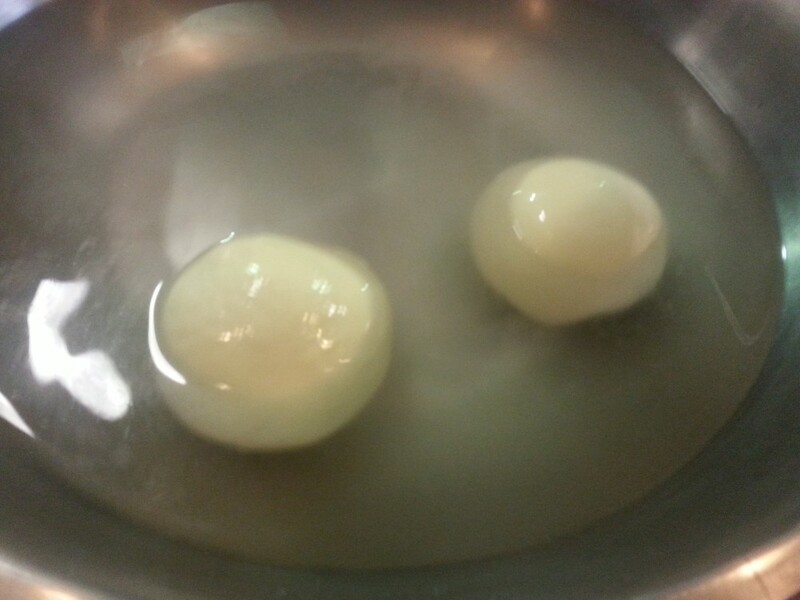 Carefully mould the mozzarella into a round ball, wrapping it under itself rather than rolling. 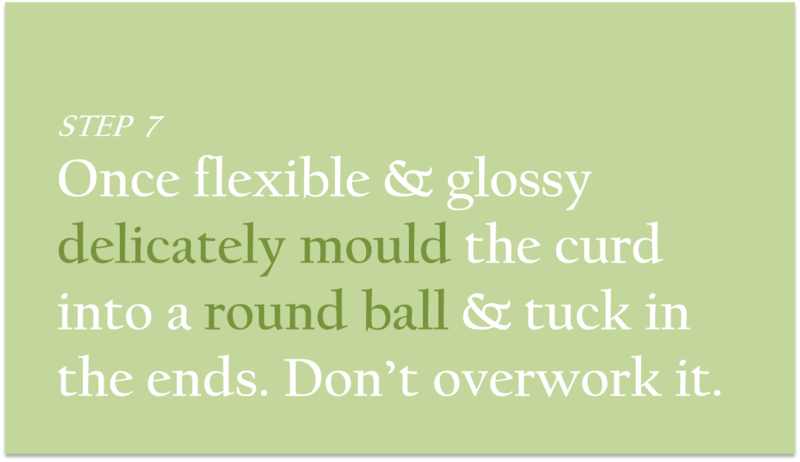 Work it gently and don’t squeeze or the end result will be tough and you’ll lose moisture. And work quickly to avoid it cooling down. Tuck in the final ends to create your ball. Of course you can make several smaller balls (boccochini) too. STEP 8: Add the finished ball to the ice cold salt water and leave it to rest for 10 minutes. After 10 minutes the mozzarella is ready to eat. 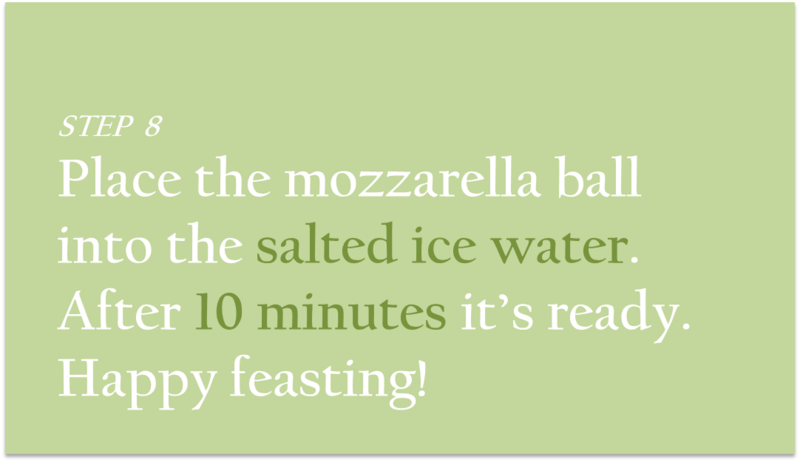 Measure your quantities and monitor your temperature carefully – the best mozzarella results from precision. The recipe isn’t too forgiving to giving it your own spin. To store your mozzarella for a few days after preparing then be sure to reserve the whey at step 5. You can add the finished mozzarella into the whey to preserve in the fridge. For 2 cups of reserved whey add 1/8 tsp of citric acid. 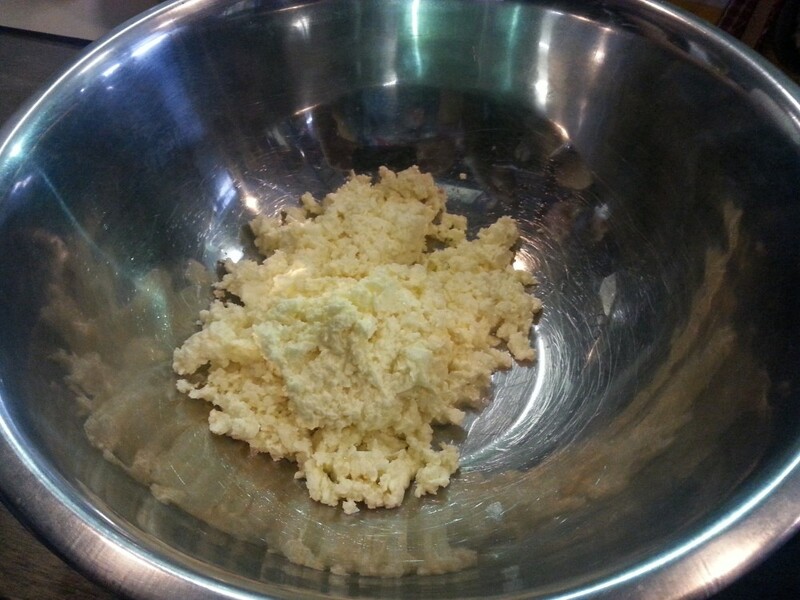 If the curd doesn’t stretch easily then pop it back into the bowl of hot water for a few more seconds. And, if needed, slightly increase the temperature of the water. Don’t throw away the unused whey – it’s highly nutritious and makes the basis of a great protein shake. Add some fruit and blend or add rolled oats and cook. Check out You Tube for videos on how to shape the curd into a mozzarella ball – it really takes practice and watching how the professionals do it can give you a head start. Mad Millie and Feast Wisely share a love for making food from scratch and knowing exactly what goes into the food we eat. Mad Millie are a New Zealand based company who create DIY kits for everyday cooks – they give you the tools and instructions you need to make cheeses, preserves and even cider at home. Their cheese kits start at only $40 and span across fresh cheese, Italian cheese, artisan cheese. Check out madmillie.com for more information and to order online. Tags: at home, cheese, Mad Millie, mozzarella, recipe, simple. Bookmark the permalink. 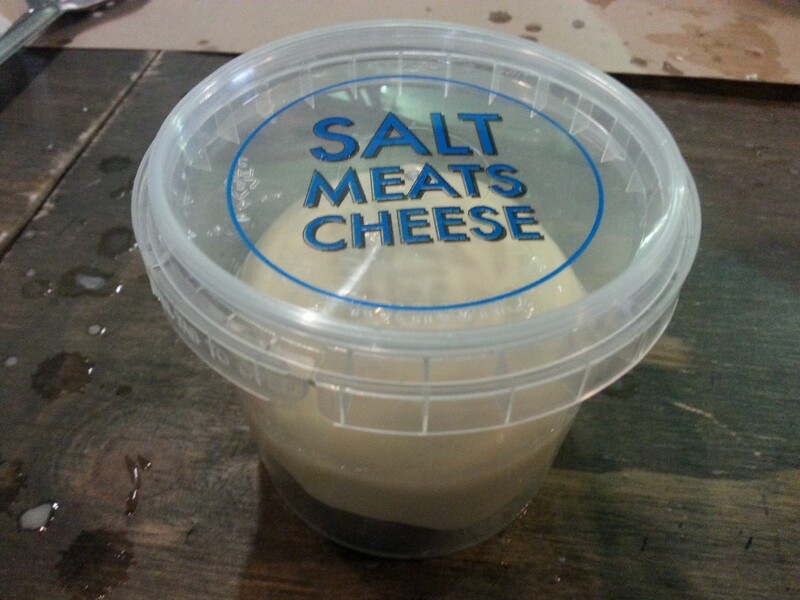 Hi Hungry Mum, good to find a fellow lover of Salt, Meats, Cheese – they just opened a new one a short walk from me in Mosman….and yes making your own is simple (but a little messy and time consuming)…..